My father used to say, “in order to gain something we should give up something else.” However, I never believed in this philosophy of my father. I needed everything in my life and that is probably what has made all the difference. 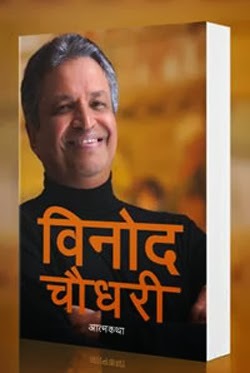 This is how Mr. Chaudhary ascribes the reason of his success in his autobiography, “Binod Chaudhary”. Mr. Chaudhary, a renowned industrialist and the first Nepali citizen to register his name in the Forbes Magazine’s list of Worlds’ Billionaires, can be a good role model for the wannabe businesspersons and entrepreneurs of Nepal. His autobiography came just in time shortly after he registered his name in the list. I was very eager to read this book when I learnt about it for the first time. And it didn't disappoint me. This book is a must read one for the aspiring businesspersons and entrepreneurs. Chaudhary has described his childhood, early youth and adulthood. He has discussed family matters as well as his business matters. He has described his strategy to take his family business to a newer height. While reading this book I was convinced that he was speaking the truth even though, I have always wanted to and still want to doubt him. How could a shrewd businessperson like him speak the blatant truth about his business? That was my feeling while I was reading the book. Nevertheless, as I followed him through the book, visualizing his journey to become one of the top business tycoons in the country, I found that he was an amazing storyteller. The story was really amusing and the presentation by the writer Dipak Shrestha noteworthy. Chaudhary belongs to the Marwadis race, which is renowned for their trade and business. Therefore, it wasn't a surprise that his father himself was a renowned businessperson of his time. Mr. Chaudhary was brought up in the environment which was all surrounded by business. He had relatives in India and Nepal who were also engaged in some kind of business activity. Therefore, he was unconsciously prepared to earn this fame since his childhood. Pashupati biscuit and the Wheat mill, along with the Arun Emporium were some of the successful ventures of his father which had already made his family rich and influential by the time Mr. Chaudhary stepped into his youth and adulthood. What he did after his father fell ill was to reunite his father’s ventures and bring them under his wing. He then started expanding his businesses especially the profitable ones and then started stepping in new industries as well. For example, to make the use of wheat mill, he made biscuit and noodles. Wai-Wai branded noodles gave him the name and fame he was aspiring for. The success of Wai-Wai noodles paved the way for him to not only expand its production but also to enter into newer industries. His business ventures and corporate partnerships have now spread over the world. He made extensive investment in the hospitality sectors which helped him grow his fortune steadily. He has many projects running in Dubai, Maldives, Thailand, and many other nations, under the brand of Zinc and Glow Y Zinc. Other sectors where he has made investments include banks, finance companies, health, hydro-power, real-estate, housing, and so on. So, the book contains a lot of information about him, his companies and his business practices, making it a worthy read for any business scholars and enthusiasts. Now for all the details, I urge you to read the book by yourself. Believe me, you will appreciate it!